Eden Housing Association is continuing to build affordable homes in Eden, with seven properties underway at Brent Road in Penrith and plans to start building up to seventeen more later this year. The plot at Brent Road in Penrith is currently being developed to make best use of land that included unused garages recently described as ‘an eyesore’. Two semi-detached two bedroomed houses are being built and presented for sale as shared ownership, alongside five two bedroomed bungalows which will be offered for rent to local people over fifty five. At a cost of around £800,000, these homes give new purpose to this land and reduces the risk of anti-social behaviour. Even more importantly, it provides retirement homes for older residents in Penrith and an opportunity for younger people to step onto the property ladder. Built on the edge of woodland, the engineers and contractors have bolstered the banks of the wood with sheet piling to prevent any potential slippage. Reinforced retaining walls mean the gardens of four bungalows will have a private outlook and give a real sense of rural location, whilst being in the heart of the town. Work on the new homes is progressing according to plan and aims to be completed for new residents to move in before Christmas. The shared ownership opportunities mean prospective buyers can buy between 25-80% of the two bedroomed houses, with the option in the future for outright ownership. The houses can now be viewed on the Help To Buy website (www.helptobuynw.org.uk) and sales are being managed by Wilkes Green & Hill. The bungalows have been designed for retirement living and all have two bedrooms, a wet room, private garden and drive. The properties will be offered for rent to local residents over 55 and will be advertised on the Choice Based Lettings system, Cumbria Choice later this year. Anyone interested in the bungalows is advised to register on Cumbria Choice (www.cumbriachoice.org.uk) as early as possible. Rebecca Field, Development Manager at EHA, said “This is an exciting development in the heart of Penrith where we are working closely with the community and our contractors, Ashcroft Construction Cumbria Ltd, to minimise any disruption. We’re currently at the foundation stage and there is already growing interest in the new homes which will look modern but also in keeping with the area. 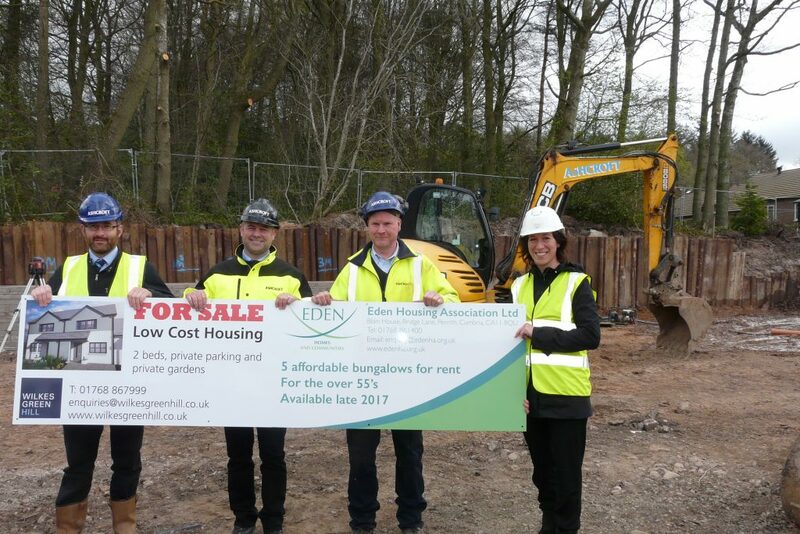 The next building project to be progressed by Eden Housing Association is a development of three, one bedroomed bungalows at Sim Court on the Pategill estate in Penrith. Work begins in the summer to increase the Sim Court supported housing scheme to twenty two homes.